RO: După o “muncă istovitoare” de 3 ore, am reușit să termin prima versiune de jucărie croșetată a unui personaj dintr-un joc, Isaac. Cred că e singura jucărie pe care am terminat-o într-un timp atât de scurt. Croșetarea componentelor nu presupune mult timp, însă finisarea, coaserea și decorarea acestora presupun o atenție mai sporită și mai mult timp de lucru. Da, frumusețea unei jucării e-n detalii și finisaje. Isaac e lucrat din bumbac Performance, o nuanță de roz deschis. Croșeta de 3 mm, ochi de plastic negri, o bucățică de piele falsă pentru gură (poți înlocui cu fetru) și umplutură din melană dărăcită (da, nu produce alergii). 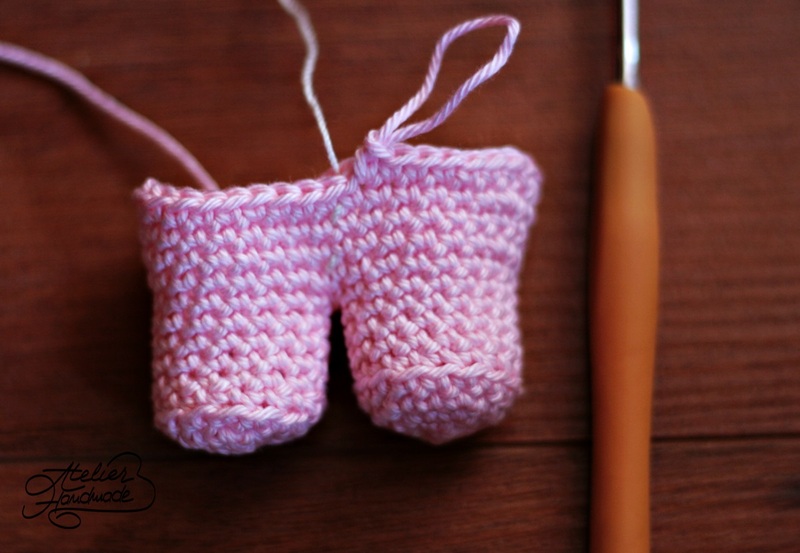 – sc2tog – single crochet 2 together. Înseamnă descreștere / is decreasing. 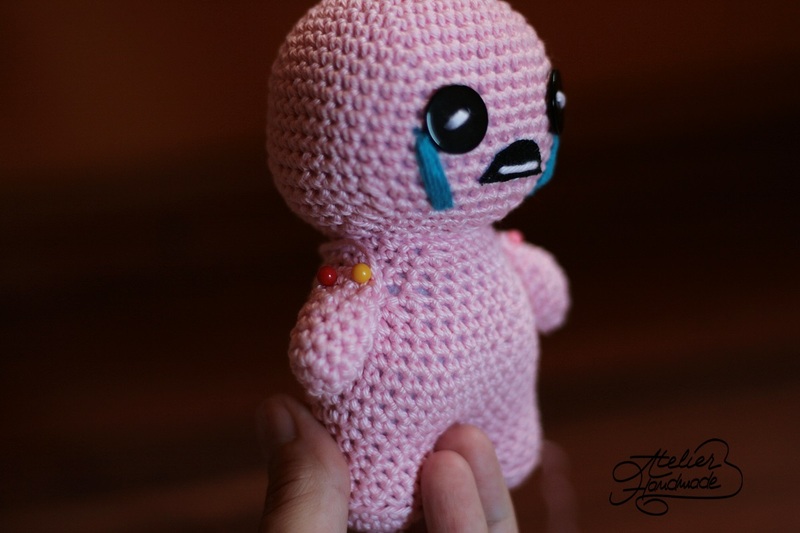 EN: Isaac, a character in a game (a gamer knows!) 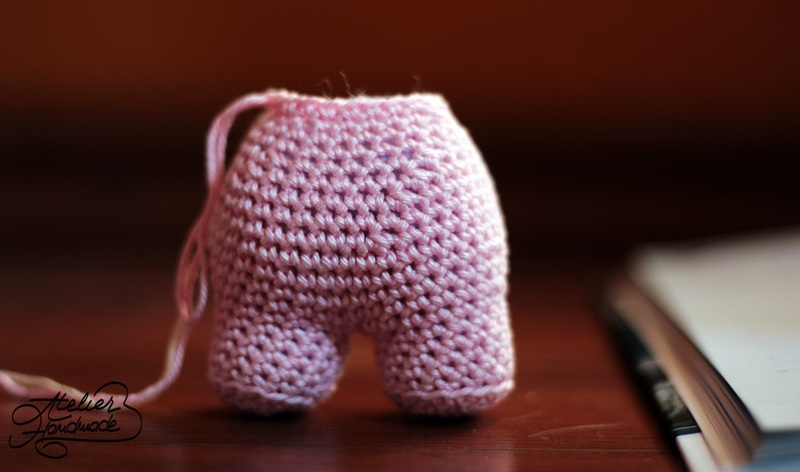 is my first amigurumi crocheted in just 3 hours. 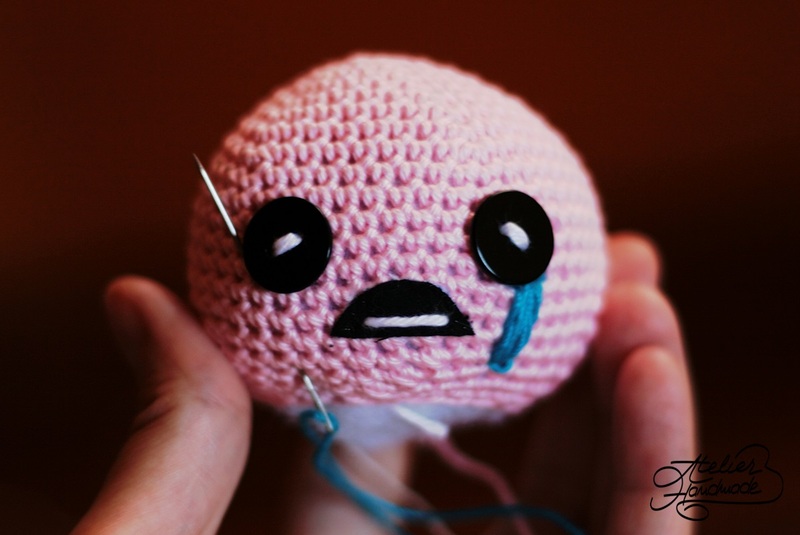 The beauty of a really good amigurumi is in the details, in how you sew the components and how you make the facial expression. 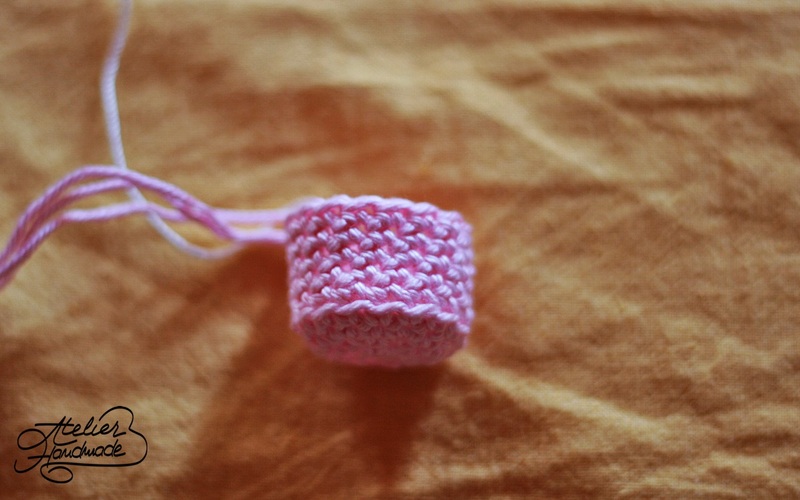 Isaac is made of Performance cotton, a pale pink color, worked with a crochet hook of 3 mm. I used plastic two hole buttons for the eyes, some fake leather for the mouth and some non allergenic stuffing. 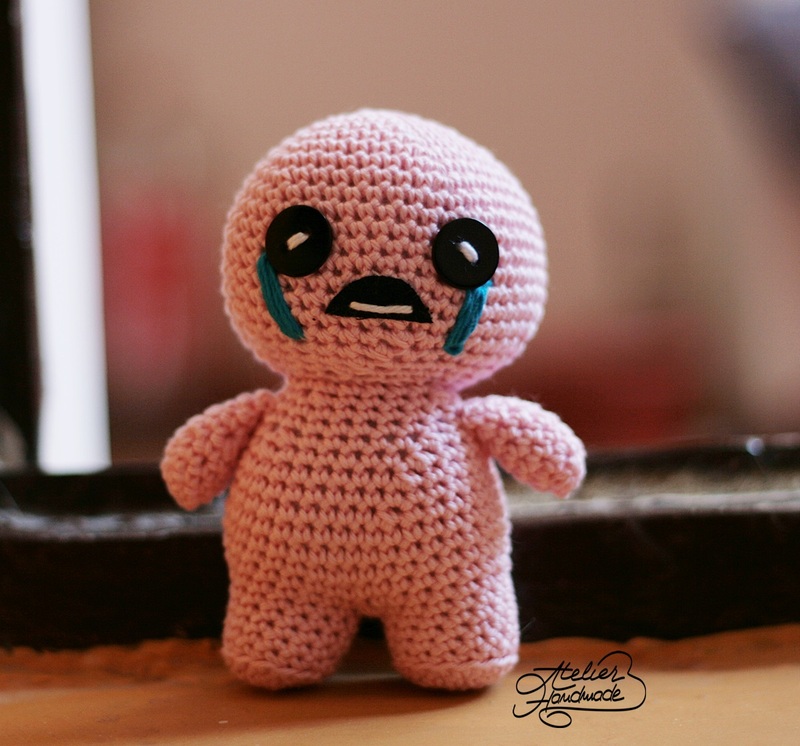 Just like most amigurumi, Isaac is worked in the round, no joining at the end of the row. 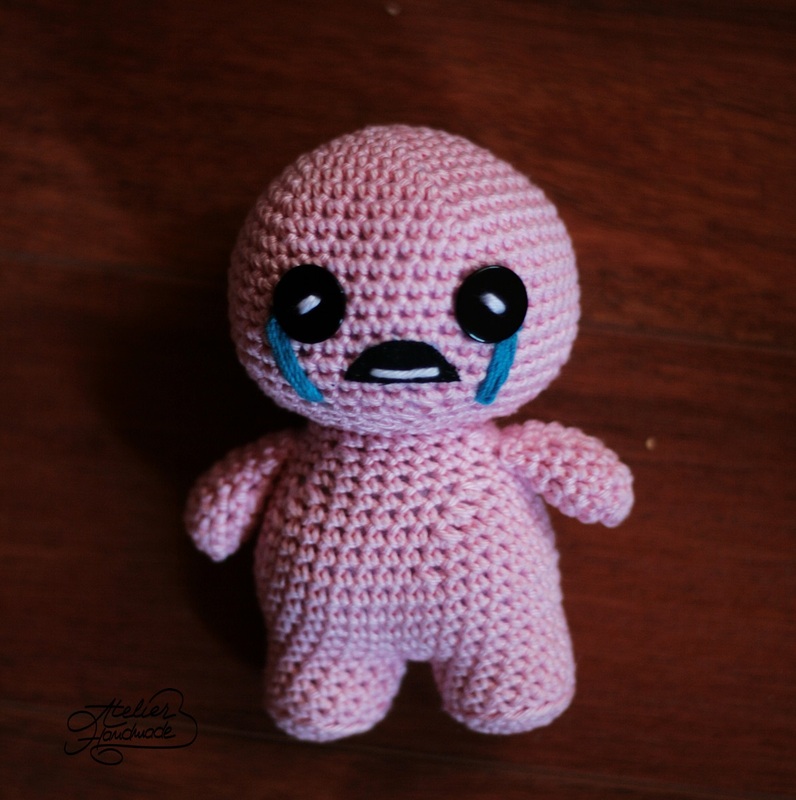 Here is the pattern, if you want to make an Isaac for yourself. R1: start with 5 sc in a magic ring. R1 of Body: Join the second leg with the first with a sc and place a marker where you just joined. 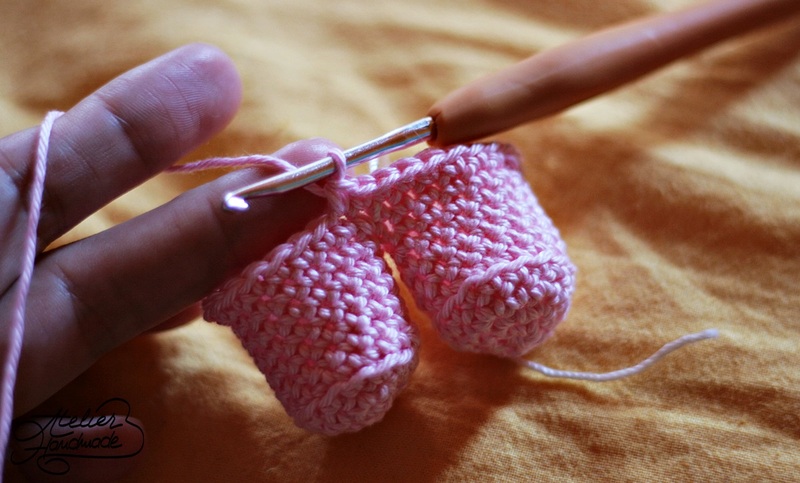 Keep that marker until you finish this amigurumi. 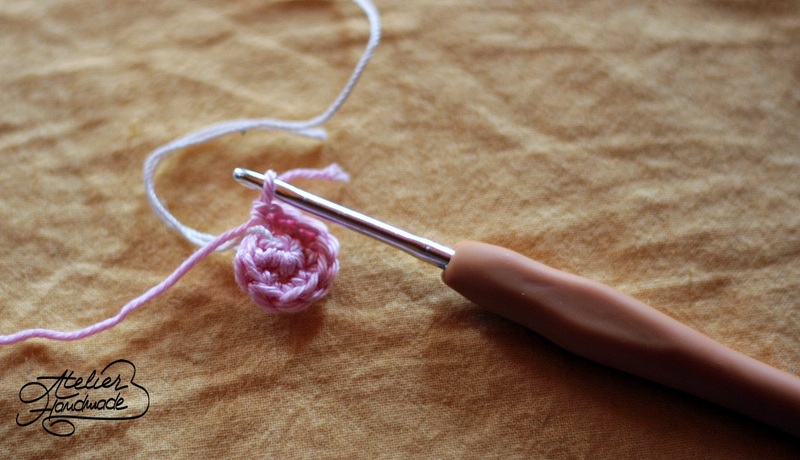 You can use a thread of yarn or a plastic marker. After joining work sc in the round till you reach the marker. You should have 32 sc in total, 15 sc per leg and 2 places where you joined the legs with sc. R2: 1 sc in the next 7, 2 sc in the next 2, 1 sc in the next 14, 2 sc in the next 2, 1 sc in the last 7 – 36 sc in total. 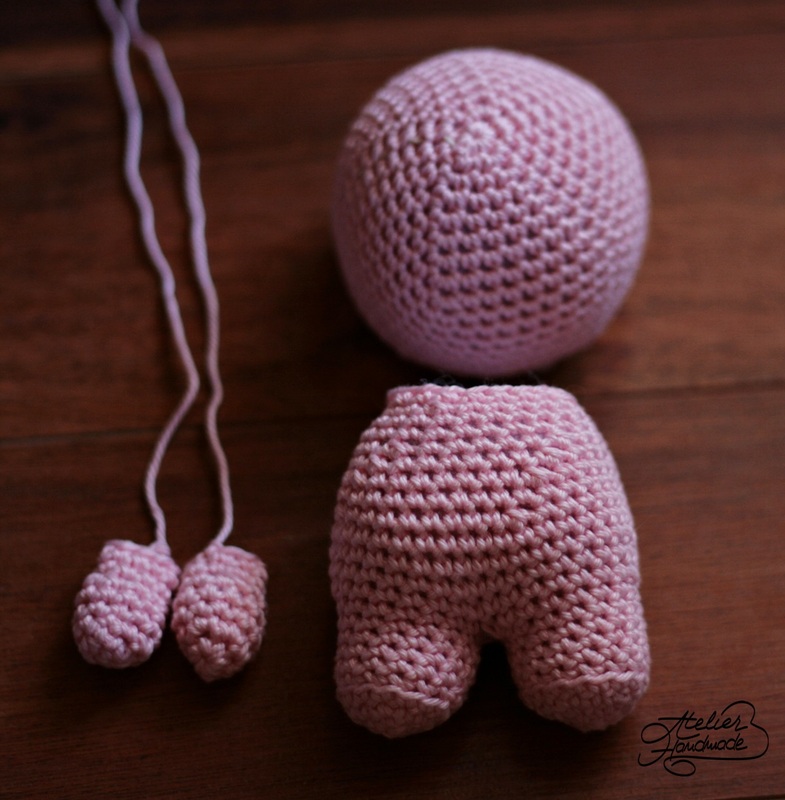 Leave a long thread of yarn for sewing the head onto the body. 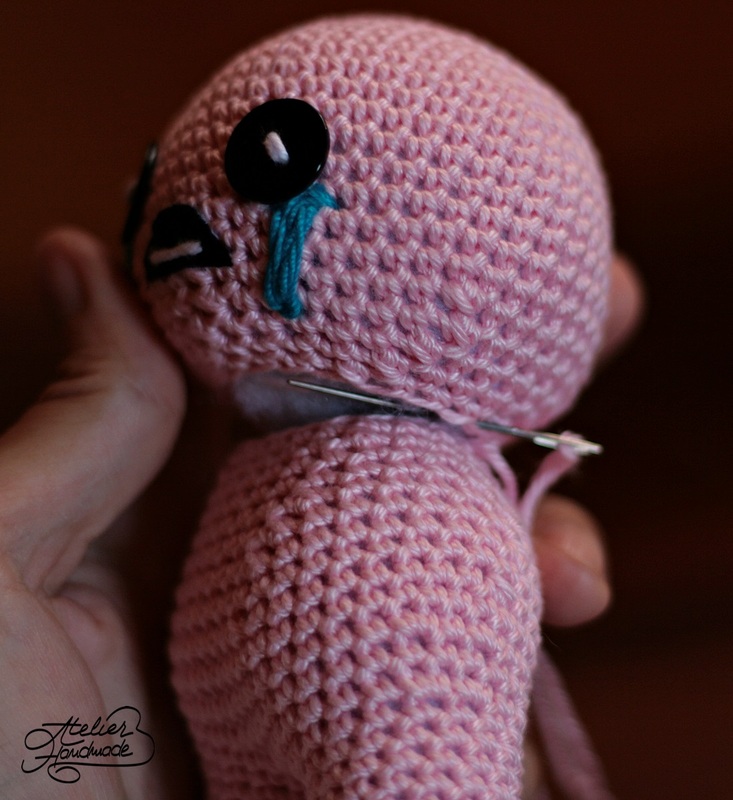 But before sewing the components, lets make the eyes and the mouth. Use 2 plastic or wooden two hole black buttons and add them between 12th and 13th rows. For the mouth cut a piece of black fabric, sew a straight line with white yarn and pin it. 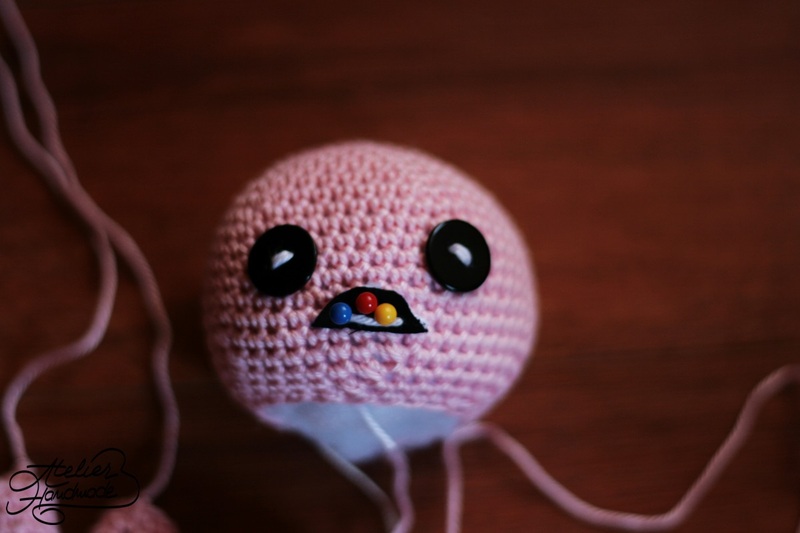 Then sew the whole black mouth on the head, between the eyes, but below with 2-3 rows. I used transparent thread to sew it, it looks better. Now sew the head and the body together. And then fix the arms with pins, then sew them together.